Figures 1a and 1b. Early (1a, left) and advanced (1b, right) southern rust can be recognized by the orange/tan spores produced (mainly) on the upper leaf surface in small pustules and can be rubbed off by hand. Note the additional rectangular gray leaf spot lesions in Figure 1a (upper left). (Photo courtesy of Casey Schleicher, formerly UNL). Southern rust (Figure 1) has been confirmed in many counties in eastern Nebraska, including as far north as Cedar and Knox counties bordering South Dakota, as indicated on the IPM PIPE website. Across this area, the disease reportedly varies from barely detectable to moderately severe patches with nearby fields often seemingly unaffected. The highly variable distribution of the disease necessitates that each field be scouted to determine whether it is present. Do not rely on knowledge of disease in nearby fields. Favorable weather during the last two weeks has likely supported the increase in disease in some fields and movement to other fields that may not be indicated in the distribution map. Southern rust is likely already present in low levels in most of the counties in this part of the state, but may not develop in every field. Repeated and frequent scouting of corn fields is critical to determine if it has developed and to what extent. 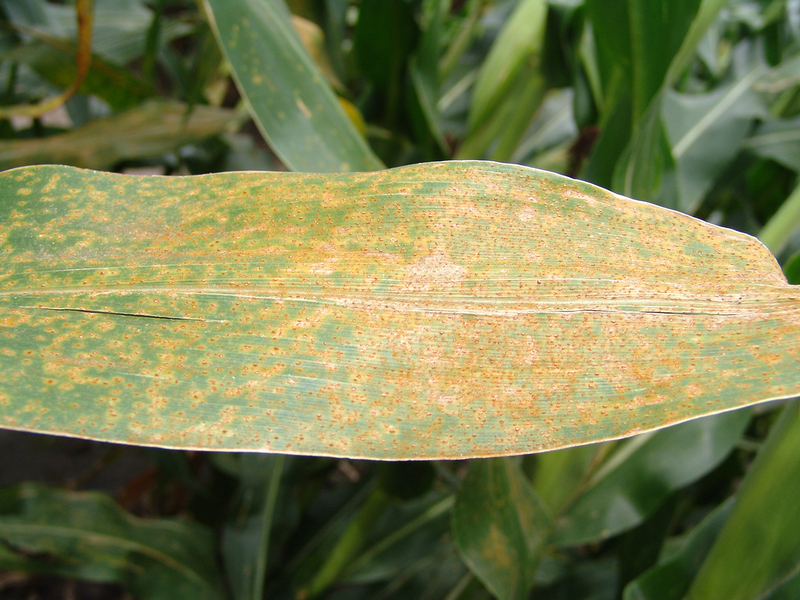 It can take a few days to several weeks for southern rust to develop and become severe, complicating fungicide treatment decisions. 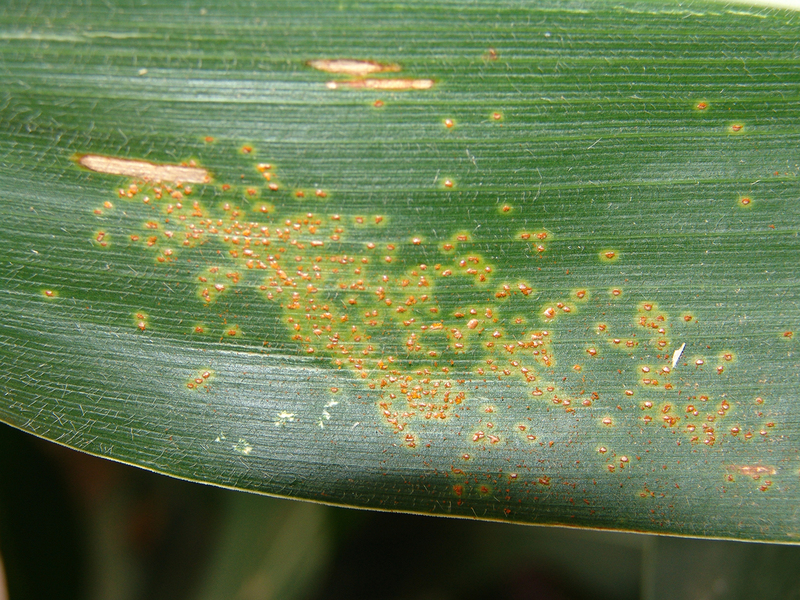 The most reliable method for identifying corn rust diseases is through examination of microscopic spore characteristics, which can be done quickly for samples submitted to the UNL Plant and Pest Diagnostic Clinic. Southern rust spores are usually orange/tan in color, produced mostly on the top side of the leaf, and are easily wiped off. They can be easily mistaken for similar looking diseases. Figure 2. Gray leaf spot has developed quickly during recent days in some areas with a flush of small, new lesions. Look for rectangular gray lesions, limited by leaf veins that start in the lower leaves and move upward on the plant. Gray leaf spot has advanced above the ear leaf in many areas of the state. 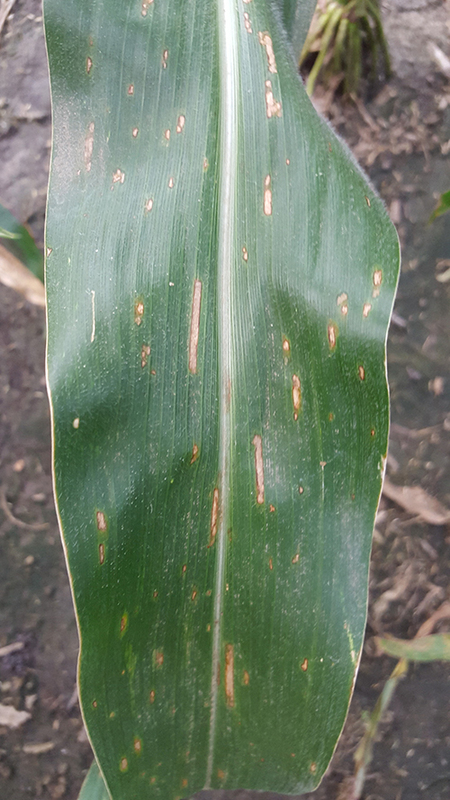 Many people have observed a rapid increase in development of small gray leaf spot lesions (Figure 2) in recent days that often moved quickly above the ear leaf. The increase in temperatures and relative humidity is likely to blame for this rapid increase in disease severity. As long as conditions are favorable, gray leaf spot lesions will continue to move up the plant and lesions will expand. Familiarize yourself with the expected reactions of your hybrids to various diseases based on ratings provided by your seed companies. A list of foliar fungicides labeled for use on corn in Nebraska and their characteristics are summarized in the 2015 Guide for Weed Management with Insecticides and Fungicides. Results from foliar fungicide trials conducted in Nebraska are available in CropWatch. These results were collected from trials with natural infestations of gray leaf spot and sometimes mild southern rust. Other resources linked below can help you identify diseases and track the Nebraska counties where southern rust has been confirmed. When viewing the map of affected counties, keep in mind that counties highlighted in red are ones where at least one sample was confirmed to have southern rust based on laboratory examination. And, red shading does not imply that all fields there have southern rust. Southern rust must have been confirmed in the laboratory to highlight counties red. Likewise, counties and states that are not shaded in red does not imply that the disease is not present there, as well, and fields should be monitored for southern rust development so that treatment decisions can be made in a timely manner for better disease management, as needed.